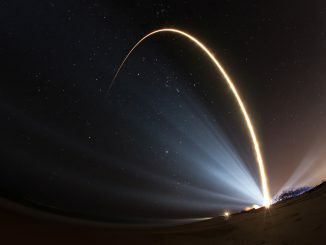 CAPE CANAVERAL — After four months of drama in space caused by a crippling failure of its main engine, a U.S. Navy’s mobile communications satellite has successfully rescued itself and achieved a usable orbit. The Mobile User Objective System satellite No. 5, launched from Cape Canaveral on June 24 atop a United Launch Alliance Atlas 5 rocket, lost its primary orbit-raising engine just five days after reaching space. The engine was supposed to fire 7 times over 9 days to push the Lockheed martin-built craft into a circular geosynchronous orbit 22,300 miles above the Earth, inclined at five degrees to the equator. With some maneuvering already accomplished before the main engine was lost, MUOS 5 lifted its perigee to around 9,471 miles and reduced inclination to 9.8 degrees, hobbyist observers tracking the satellite reported in early July. They were the first to notice and publicly reveal that the craft has suddenly stopped maneuvering. In order to use the $600 million satellite, the Navy had to get the craft into a geosynchronous orbit. So controllers had to improvise, relying on the smaller, less powerful thrusters meant for orbital relocations and station-keeping maneuvers. Between Sept. 7 and Oct. 22, a total of 26 firings by the thrusters lifted MUOS 5 to a meaningful, synchronous orbit and salvaging the mission in the face of failure. “This orbit is slightly less circular and more highly inclined than the intended orbit,” the Navy acknowledged today. Hobbyist satellite observers say MUOS 5 has settled into an orbit of 21,687 by 22,787 miles at an inclination of 9.7 degrees, and it is located at the Western “stable point” of 105 degrees West longitude. “Synchronous spacecraft located there experience minimal longitudinal drift, greatly reducing, if not eliminating the need to perform east-west station-keeping maneuvers,” said Ted Molczan, a respected satellite analyst. 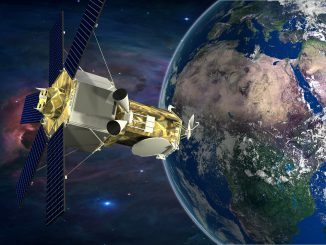 When the 100-pound-thrust main engine failed, MUOS 5 was left in a 16-hour orbit more than 12,000 miles from its target. 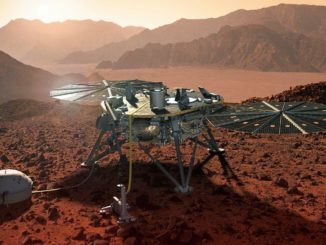 Luckily, the craft came equipped with 18 monopropellant hydrazine thrusters designed for attitude control — a dozen 0.2-pound thrusters and six 5-pound thrusters. The Navy declined to identify the culprit for the propulsion system woes or implicate a specific component. Sources say, however, it was some sort of nozzle failure, and the Air Force has said its GSSAP orbital patrol satellites were used to image the satellite as part of the post-anomaly investigation. After obtaining a good orbit, the satellite successfully unfurled its umbrella-like antenna reflectors and power-generating solar arrays by Oct. 30. The on-orbit test program of spacecraft systems and the communications payload — expected to last several months — began today. Acting as cellphone towers from geosynchronous parking spots over the equator 22,300 miles high, the MUOS satellite constellation generates global coverage and reaches just miles shy of the poles. 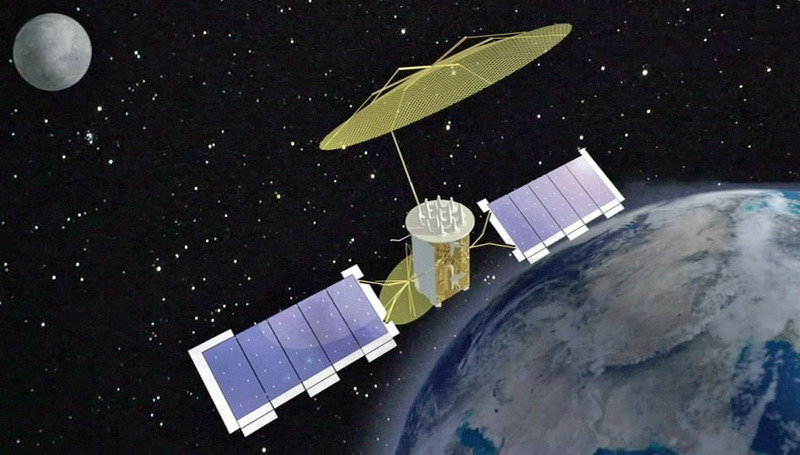 MUOS serves as a dual-provider of both voice traffic currently routed by the Navy’s legacy generation, albeit aging, Ultra High Frequency Follow-On spacecraft. The first four MUOS craft are supplying UHF communications today. Coverage to legacy users transmit through 17.7-foot-diameter reflectors on the the satellites and the advanced, multi-beam features of MUOS to significantly increase the transmission capacity over the Navy’s previous satellites use large 46-foot reflectors on MUOS. Once checked out and declared operational by next spring under the revised schedule, MUOS 5 will immediately go into service for the legacy UHF users. The 3G-type services, however, will be held in reserve since the satellite is a spare to replace one of its sister-craft in the future. Positioning of MUOS 5 will be changed from the pre-launch plan, however. Originally slated to serve over the Indian Ocean, it appears that the craft will remain in its current, stable location. “Subject to results of normal satellite testing currently in progress, the satellite is expected to fully perform its mission in its current orbital location. The satellite will not be relocated to another orbital location,” the Navy said today. But at the heart of MUOS is the new “rugged smartphone” capability that enables users to communicate with small devices, unlike the bulky gear needed to talk with the Ultra High Frequency Follow-On satellite fleet. With the older satellite system, users had to be stationary with an antenna positioned directly toward the satellites to send out information. MUOS will enable communications on the move, enabling users to send and receive data, make calls and watch video anywhere.